After I’ve seen the promo for “Flatline“, I thought the episode had potential to be really creepy. Unfortunately, I didn’t end up liking it that much. While I really love Series 8 as a whole, I also have my issues with it. So far, there haven’t been any terrible episodes, but there also haven’t been any outstanding ones. I’ve been waiting for an episode to really wow me and excite me, like for example “Vincent and the Doctor“, “Blink“, “The Empty Child“/”The Doctor Dances” or “The Girl in the Fireplace” did. And those are just the examples I could come up with from the top of my head! Again, “Flatline” wasn’t bad at all, but I doubt it’ll stay in my memory forever. However, it did have it’s moments! Since the Doctor was stuck in the shrunken TARDIS, Clara had to do his job and defeat the monsters. Here are my thoughts about the occurrences of “Flatline”. So, as I mentioned above, our weekly monster was a little different this time around. It started out in 2D, but quickly evolved to something more 3D by draining the TARDIS of its power. In my opinion, those creatures (Do they have a name? They remind me a bit of the Vashta Nerada to be honest) have the potential to be really creepy, but didn’t fully realise said potential during the course of this episode. In the end, they just looked like pixelated and glitching Zombies. Danny … oh poor Danny. Always having to worry about Clara. He’s not stupid! He clearly knew she was getting into trouble with the Doctor and she shouldn’t lie to him. If she’s getting into a dangerous situation, he needs to know that. At least, he said that that’s a deal breaker when they started dating. Rigsy (Joivan Wade) was sweet and he looked like he had a crush on Clara. But why exactly did he want to sacrifice his life for no reason? Did not like grumpy old man Fenton (Christopher Fairbank), but I suppose it was intended that we dislike him. I like the use of psychic paper, even if it was beaten by utter lack of imagination. Did I just imagine that, or did the TARDIS in siege mode look like the Pandorica? I know that it was Gallifreyan writing on the box, but it still very much reminded me of the Pandorica. The Addams Family-hand reference was funny. The Doctor, as always, is a mystery to me. On the one hand, he had hope that it was all just a misunderstanding with the enemy creatures and I again saw a glimpse of the man who finds every creature in the universe important and beautiful, but then he did not hesitate to destroy them. He compliments Clara for how she handled the situation, but at the same time tells her that his actions have nothing to do with being good or goodness. I still want to believe that the Doctor is a good man, but he himself seems to have stopped believing that altogether. However, I still like the scenes where we see that the Doctor cares about Clara and sometimes even is jealous, even if he doesn’t like that she’s becoming more like him. Missy had her almost obligatory tiny appearance again. Tonight’s episode seemed to be another hint that she might truly have been the woman in the shop. She called her “My Clara” (wasn’t that Eleven’s thing?) and said that she chose her well, so, that just makes me assume she’s the one who gave Clara the Doctor’s phone number. After the torturous and slow build-up of her character I hope the season finale, which supposedly reveals everything, will be as good as I expect it to be by now. What were your thoughts about this week’s episode? I’m already looking forward to “In the Forest of the Night” (which oddly makes me think about “Forest of the Dead” and the Forest people, although I doubt it has any connection to those things), because Danny will finally tag along on the TARDIS … even if it is with an entire group of children. I personally enjoyed this episode, and I think the writer, Jamie Mathieson, is just what Doctor Who needs: a new writer with plenty of fresh ideas. The story progressed like a very unconventional horror/sci-fi story, and it hit all the right notes for me. I think this and “Mummy on the Orient Express” will be among my favorite episodes for the season. I think she lied to Danny because we’d laugh at it, and I’m pretty sure that Rigsy, who’s probably never been told he’d be good at anything (especially not by folks like Fenton), wanted his one moment in the spotlight. I absolutely loved the Addams Family reference, and I’m looking forward to next week. It’s about time Danny joined them on the TARDIS for an adventure! The thing is, I never really find a fault in a the recent episodes, but they still aren’t as gripping as they used to be. I don’t know how else to explain it … So, it’s great to hear that you liked it! I am glad someone did! Maybe I’m just not as into it or something like that. I know what you mean about Rigsy, but while watching that scene I still thought it was strange. Maybe it was. But who doesn’t want to be remembered as a hero, especially when it looks like it’s only a matter of time before you suffer a really nasty death and even if you live people still look down on you as trash? I know, but even after he knew that no one had to die, he didn’t seem very eager to get out of the train. That’s what I call a death wish, even if I understand that he wanted to be heroic and remembered as someone who did something good and special. This was my least favorite episode of the season. Maybe because the 2D monsters gave me feverish, nightmarish flashbacks to “Fear Her”. I liked elements of it, like the Doctor showing Clara how to *be* the Doctor. But my main problem is becoming the Danny/Clara relationship. The Clara/Danny phone call in “Flatline” was just a horrible moment for the series. It definitely wasn’t my favourite episode either, but I didn’t think it was that bad. I’m just not generally excited about it. I believe the monsters had a lot more potential than they managed to realise in the episode. I’m getting tired of Clara being the focus. She’s an important part of the Doctor’s life, yes, but this isn’t her show. I don’t have that much of a problem with the Danny/Clara relationship. I just think Danny isn’t that stupid, as to not know what Clara has been up to and I also think that their relationship would work better if he tagged along on the TARDIS as well. The lying has to stop… poor Danny! I love Clara, but the focus of this entire season was just too much on her. It needed to be on the Doctor instead and therefore I wasn’t really that happy with the episode. I understand why Clara lies, but I stopped feeling sorry for Danny at some point. Seriously, how could he not have figured out what’s going on by now? Keep me updated on where you are in the series 🙂 there is still a lot to come! I think the dynamic always worked really well until this season, even during the one with Matt Clara wasn’t too dominant in the storyline, although we wanted to know her secret. We’ll have to see how it continues. yeah, maybe because she was so underdeveloped last year, they’re overdoing it a big this season? Do you think the rumours are true about her not returning for season 9? I don’t know … I know that she’s in the Christmas special, but I have no idea if she’ll be in Season 9 as well, it all depends on what happens at Christmas. I’ve read several interviews with Jenna, where she just refuses to give any statement, because she thinks it is more fun for the fans if they don’t know what’s happening. 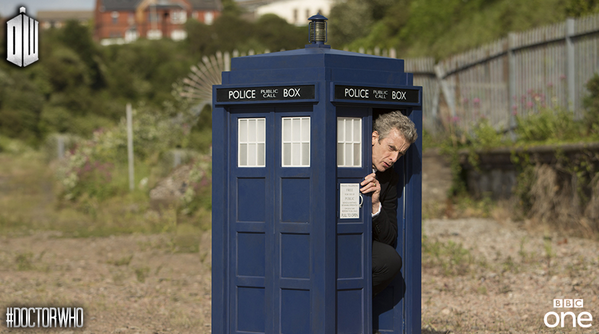 But shooting for Series 9 already started last month, so I’d like to think that we’d know it if there was someone entirely new on set. After Death in Heaven I am not exactly willing to let her go just yet. You really lost interest in her, didn’t you? I wonder if you still want to get rid off her after you’ve actually seen the finale. I think Clara was brilliant in the last two episodes. oh no! I like Clara more now than I ever did, seriously… I would like her to stay. But you know when there was Rose but there was also Adam (we don’t talk about him), or Jack and then Mickey. Again with Donna, Martha was there, Jack. I like when there is more people (even one-offs) on board as well as the current companion. I love Clara with 12, much more than with 11. Oh okay, I get it. I thought you wanted an entirely new companion. I loved James Corden as a sort of “companion” and Jack was always great, but I didn’t really appreciate Martha returning that much. But it is more fun if there are more people he travels with than just one person. That’s also why I wanted Danny to tag along. It would have changed things up as well. This season we ALWAYS had Clara, maybe an episode of the Doctor alone, a one off as all the other had, would have been great. I was hoping that Mummy on the Orient Express would be an episode just with the Doctor. It would have been the perfect chance after the fight with Clara, but nooo of course she was in it again. I can already tell you that she’s in the Christmas special and I don’t think she only has a minor role.